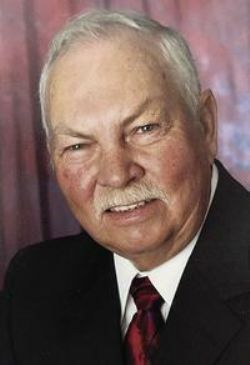 Arnie was a resident of Monroe, Nebraska and passed away peacefully on February 8, 2019. A Celebration of Life will be held Saturday, February 16, 2019 at Augustana Lutheran Church in Genoa, Nebraska. Arnie, along with his wife Karen, will be interred at Valley View Cemetery. Arnie is survived by children Doug Boyd, Sandy (David) Mulholland, Todd (Jennifer) Boyd and Tammy (Richard) Kush; grandchildren Scott (Myra) Mulholland, Sara (Jeremiah) Bauer, Kara (Cody) Smith, Zach Boyd, Tiffany (Robby) Lindeman, Brandon Boyd (Megan Andreas), Jason Boyd (Nancy Griess), and Nicholas Boyd; great grandchildren Cameron, Keely, Quentin, Mackenzie, Paizley, Zoey, Jaxon, Harper and Vivian; Sisters Leona Heft, Vonda (Jim) Conant, Donna (Bruce) Fleck. Arnie was preceded in death by his wife Karen (Steffes) Boyd; parents Russell and Lillian Boyd; brothers John, Melvin and Alfred Boyd.